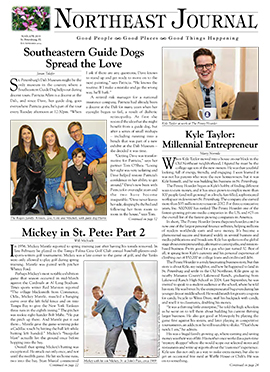 St. Petersburg cannot be called a ‘one-horse town.’ In fact, in addition to the quaint horse-drawn carriages along Beach Drive, the city has a Mounted Police Unit that patrols the downtown waterfront parks and entertainment district. 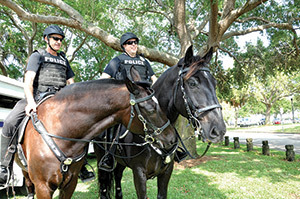 The Mounted Unit, which consists of two officers and two horses, is part of the Traffic Division of the St. Petersburg Police Department as an enhancement to the police presence downtown, particularly during weekends and special events. 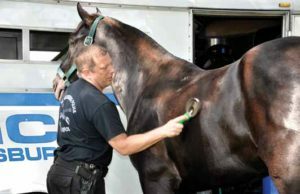 In July, 2009 when the Boston Police Department was in the process of disbanding their historic mounted units, they donated two of their trained, Percheron/Thoroughbred-cross horses to the St. Petersburg Police Department. 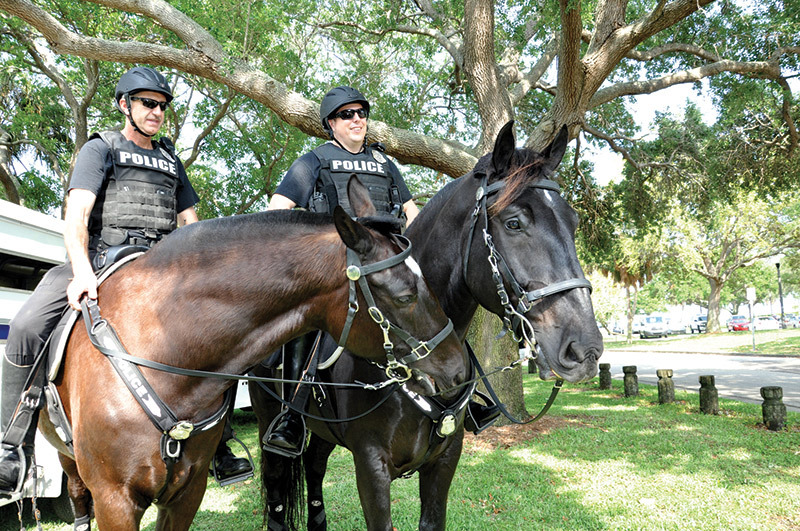 The last time the St. Petersburg Police Department employed a mounted unit was back in 1927. The donation of these horses facilitated a resurgence of the unit in the bustling little metropolis that is now the City of St. Petersburg in the 21st century. Officer Jason Hughes’ four-legged partner is Jacob and Officer Ron Try’s is Brooklyn. 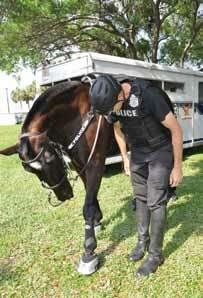 The officers and their equine colleagues are perfectly matched. Officers Hughes and Try successfully completed intense horse maneuver training from experienced mounted officers of both the Tampa and Pinellas Park Police Departments. The officers have developed expertise in controlling their mounts in fluctuating situations within an urban environment. They can even make an arrest without dismounting. Hughes is a Florida native, born in Orlando, and has been an officer with the St. Petersburg Police Department since 2003. His prior riding experience was as a ‘knight’ jousting at various Renaissance festivals. Try, on the other hand, was originally from Michigan, joined the U.S. Navy, and then came to Florida where he joined the police force. Try has more than 25 years with the department and has owned and ridden horses as a hobby. Both Jacob and Brooklyn are Percheron/Thoroughbred-cross geldings that were born in Toronto, Canada on farms under the auspices of the Royal Canadian Mounted Police. Their particular cross-breed was designed to blend the best characteristics of both Percherons and Thoroughbreds. Percheron is a heavy draft-horse similar to the Clydesdale with origins in the Perche region of France, while the Thoroughbred was developed in England for racing and jumping. The cross-breed was intended to incorporate the calm and strength of the Percheron with the athleticism and drive of the Thoroughbred, making the Percheron/Thoroughbred the ideal horse for law enforcement. Officer Hughes says that it is easy to tell the two horses apart because “Brooklyn is the one with the tough-guy (Mohawk) haircut and Jacob has a more laid-back look (free-flowing mane).” The personalities of the two horses also make them distinguishable. Jacob is the flamboyant one. He paints ‘pictures’ on canvas in his free time and donates them to worthy causes. Hughes holds the canvas while Jacob holds the brush in his teeth and bobs his head up and down to create the masterpiece. The St. Petersburg Police Department, after all, is located in the middle of the city’s art district. According to Yolanda Fernandez who handles community relations for the St. Petersburg Police Department, a painting of Jacob’s is on display at the new CASA shelter in the downtown area. Some of Jacob’s paintings were recently auctioned for the benefit of the Pet Pal Animal Shelter near the police department building, and also at the Art Exchange. Jacob also did demonstrations at Dazzio’s Art Studio. The criteria established for a donation of Jacob’s artwork is that “the organization must be located in St. Petersburg and it must be a non-profit,” said Fernandez. Brooklyn is the more staid and reserved of the two. Brooklyn serves in a dignified capacity during police memorial ceremonies, whereas Jacob is less inclined to remain still for long periods of time. However, Jacob is always nearby to provide support to his comrade and accommodate any children who may wish to pet him. 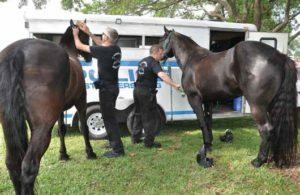 When Jacob and Brooklyn are off duty, they are in the capable hands of Patti Gail, a qualified expert with the American Riders Institute Association, who provides training, rehabilitation, and boarding at the equine sports center in Pinellas Park where the horses reside. The barn has fabulous amenities any horse would whinny for, including fans in every stall, and access to a water treadmill and ice spa (for their legs and hooves). The horses enjoy their free time in the pasture. “They love to roll in the dirt,” said Hughes. Wednesday is the start of their regular work week which goes through Saturday. When the police horse trailer pulls up in the late afternoon, Brooklyn and Jacob are anxious to go to work. They walk up the ramp, each going into his designated stall in the trailer with hardly any prompting. Once Brooklyn and Jacob have arrived downtown and have exited the trailer, Officers Hughes and Try prep their equine partners for their night shift that will last until early the next morning. The horses enjoy a thorough brushing before saddling up. The gear is a little different from standard riding tack. 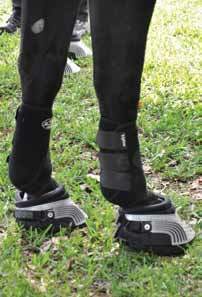 The saddles are synthetic rather than leather with very little leather in the entire tack to reduce weight since there is added equipment police officers must carry. Officers Hughes and Try put high-traction rubber and synthetic shoes over the standard steel horseshoes the horses are already wearing. These overshoes make less noise, are less jarring, and are less prone to slippage on pavement. Jacob’s shoes are actually special orthopedic shoes designed just for him since he tends to put more weight on his front legs than his back legs. The officers say one advantage to utilizing a mounted patrol is that the view is nine feet off the ground. An officer can see things above the crowd, making crowd control easier with an elevated view. 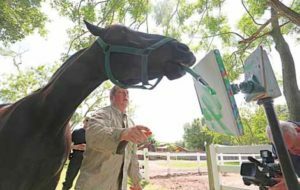 Another advantage is that, “A mounted patrol builds bridges with the community; people will approach an officer on horseback more often than they would (approach an officer) on foot,” said Hughes. Once the officers have mounted the horses, people approach them almost continuously, asking to take pictures with the horses, and if they can pet the horses. “The first three hours on duty is mostly public relations,” said Hughes. Brooklyn and Jacob are favorites around town. Although, they get a hay-and-water break when possible, Brooklyn and Jacob sometimes receive treats from store owners. They look forward to getting occasional oatmeal cookies at Starbucks and apples from Mickey’s Organics. Brooklyn and Jacob like it when they get to see their friends, the carriage horses. “Horses care about other horses the same way that dogs care about other dogs,” said Hughes. As herd animals though, the police horses would rather hang around with the carriage horses, so the time the officers allow their steeds to spend near the carriage horses is limited. Otherwise it becomes difficult to get the horses to leave one another. As the shift wears on, the Mounted Unit addresses issues in the bar district like breaking up fights, catching the occasional purse-snatcher, and thwarting public urination. “We don’t allow anyone to pet the horses after midnight,” said Hughes. Intoxicated revelers may get a little too rough with the horses, so this is for the horses’ protection. Jacob is the clown of the two. On command Jacob will roll back his lips and give a broad smile showing lots of teeth. He picks up traffic cones and water bottles. On one of the First Night events, Jacob picked up the street barricade and then slammed it down to draw attention. On Valentine’s Day he discovered a heart-shaped balloon and bandied it about to the amusement of Officer Hughes and other onlookers. Both Brooklyn and Jacob are trained to bow with one foot and head down, demonstrating their courtesy. “The horses will work hard to learn new tricks for carrots,” said Hughes. Interestingly enough, there is no sign of horse manure anywhere downtown. While the carriage horses have bags behind them to catch any droppings, the police horses don’t have that luxury. Bags would slow the police horses down and make turning corners more difficult. According to Officer Hughes, Jacob is nearly potty-trained. Like a person who can anticipate when their dog has to go, a rider knows when his horse needs to go. Officer Hughes looks for “whatever bushes need fertilizing nearby” and directs Jacob to that spot, rewarding a bulls-eye with a horse treat. If Jacob or Brooklyn has an accident, however, the officers are equipped with portable shovels to address it. When it comes time to perform their law enforcement duties, both the officers and horses know their stuff. Watching the Mounted Unit in action can be like watching the precision moves Hollywood captures on film. During one incident, the Mounted Unit successfully apprehended a fast-running offender who suddenly stopped around a corner and found himself instantly surrounded first by Jacob and Officer Hughes on one side, and then a second later by Brooklyn and Officer Try on the other with nowhere to go. Clearly, the Mounted Unit sees protecting and serving the citizens of St. Petersburg as more than a duty; they enjoy their work. Officer Hughes remarked, “The people of St. Petersburg are awesome!” Jacob nodded his head up and down in agreement. Carlson reported straight from the horse’s mouth and answered all the questions I had when I saw the images and read the headline — including the one about calls of nature — in this well-written article. Cheers to the SPPD for adding a mounted patrol, and cheers to Carlson for telling us about it!